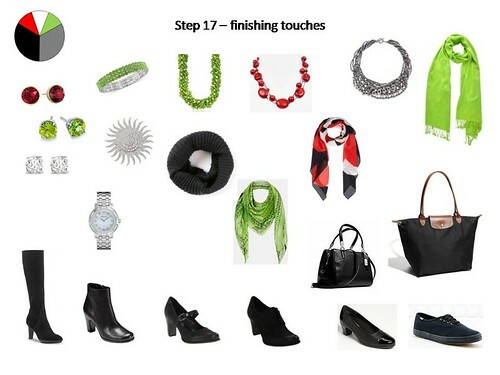 We left off having completed step 13, the second round of accessories, and had what looked like a reasonable wardrobe. I mean, I probably could have stopped there and done just fine. But there are more steps in Janice’s plan so let’s work through them. Step 14 is leisure wear. In other words, clothes to wear at home. This is a good place to add some colorful pizzazz. I already have the two pairs of pants – one is a cotton woven wide-leg style, the other a stretchy knit yoga style. I’d need to make the two tops. In reality, I need a separate capsule for homewear so I will leave these out of the subsequent slides. 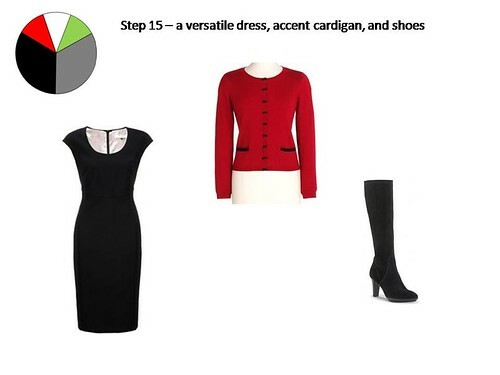 In step 15 we’re adding a versatile dress, an accent cardigan, and a pair of shoes. Janice made them on the warm weather side, with sleeveless dresses and sandals. I already have a dress in this wardrobe plan and it’s a long-sleeved one so I’ll add a sleeveless one here. I was debating between a really neat black and white houndstooth and this solid black one. The black one won because I already own it. I really love the idea of a houndstooth dress though so it might make an appearance next year. We’ll see. No sandals for this fall/winter wardrobe. Instead, I’m bringing in my knee-high boots – they’ll see plenty of wear. 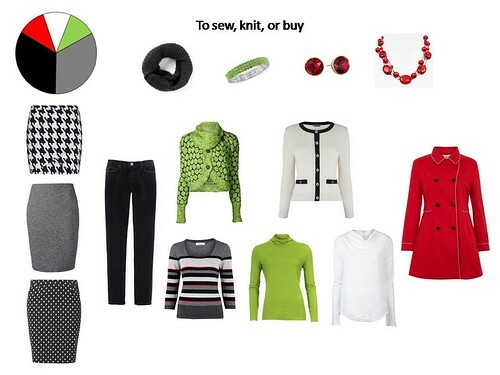 Rounding out this selection is a red cardigan, which I already own. It will require a slight refashioning but it’s definitely serviceable. 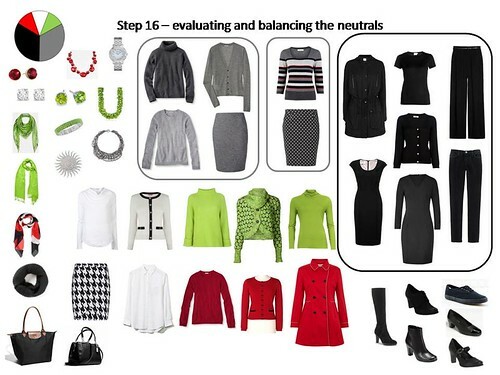 In step 16, Janice looked for a “core of four” in each of the neutrals – two tops and two bottoms that can make four outfits. I can do that with the black pieces. The gray capsule only has one bottom so I’m going to add another skirt here but not in gray. I won’t wear gray pants so there’s no use putting them here and the only skirts I wear are pencil style so adding another gray pencil skirt won’t lend this wardrobe further versatility. But a black and white houndstooth skirt would be perfect here. I am also seriously short on white items so I’ll add a white sweater and a white cardigan. I don’t own any of these three items and will have to make them. Below I included the three new pieces so the white section looks more in balance with the rest. It’s starting to look like a really large wardrobe but there are only 23 garments and that includes two coats. This wardrobe is just about done so in step 17 we add some finishing touches. Let’s take another look at the garments in the picture above to see if there are any obvious holes. Janice is aiming at 24 pieces. I’m good with what I see, but will add a black leather skirt and a ribbed V-neck sweater because these two together were one of my favorite outfits last year. The black short-sleeved tee shirt looks like an anomaly here, among all the sweaters, but for now I’ll keep it. We’ll see how it works out in real life. I have separated the clothes from the shoes and accessories to get a better idea of how things look. I think the wardrobe is looking pretty good now. 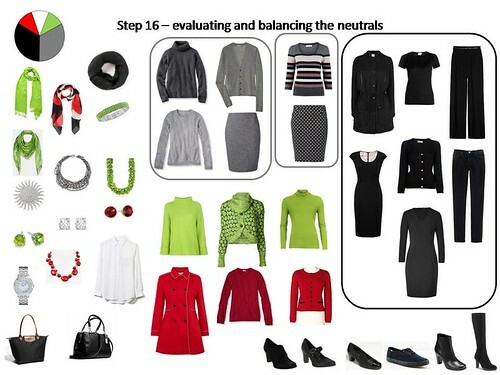 In step 18, Janice checked her wardrobe plans against her Common Wardrobe to ensure nothing was missing. 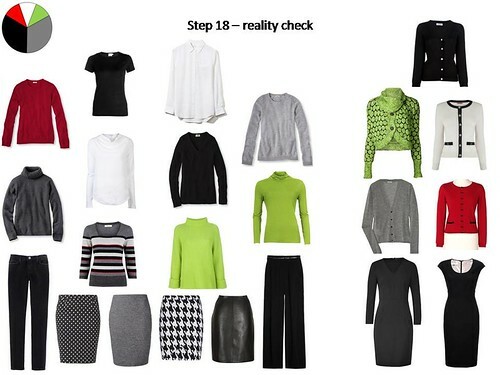 The Common Wardrobe has too many pieces I wouldn’t wear so instead, I’m using this step as a reality check. First, there are two dresses and five cardigans I’d wear with them. It sounds like ten different outfits but in reality it’s only five different looks because the sleeves or lack thereof under the cardigan won’t make any difference. Depending on the weather outside, there will really be only one reasonable dress choice on any given day. Then there are six bottoms and nine tops that work well with them. Each top goes with at least two bottoms so that’s another 18+ outfits. I also have the black T-shirt here but the chances of it being worn without a cardigan on top are practically nil. There is a bit of crossover between the two groups in that I might wear the pants and jeans with the white shirt or the black T-shirt and a cardigan, but we’ll see how realistic that is. Amazing! Your choices are beautiful… thanks for sharing them with us all! That’s a fantastic looking wardrobe. I love the organization of it all. It’s a classy wardrobe. You’ve shown me how to take an already small, cohesive wardrobe to a new level by incorporating Janice’s work. It’s great! Thank you Amy! I’m glad to hear it helped you in some way. What a great wardrobe plan. I love the colors you’ve put together. Absolutely stunning. The bold colors. The classic pieces. I would be thrilled to find this in my closet each morning! Thank you carter! The thrill of the closet in the morning – I love how you put it. It looks like you have had such a good time with this. And the result is just amazing. I really like the white pieces that you added, accenting them with black. So nice! Thank you Rhonda! We’ll see how the white pieces work out. I haven’t really worn that much white in the last few years. It’s probably time to move back to Florida, hehe. White rules there. I found your blog via the viviennefiles. I love what you’ve done with her system. And I love the pieces you’ve made–the fit is exquisite. Welcome and thank you for the compliment! Janice’s system rocks.